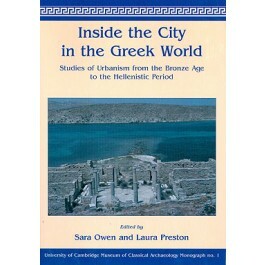 The publication of the papers presented in this volume marks an important step in the study of ancient cities. Despite having long been a focus of archaeological investigation and analysis, until relatively recently they have tended to be described rather than analysed. These eleven papers concentrate on analysing ancient urban centres from within, exploring some of the ways in which people lived in, perceived and modified their built environments. The papers span several time periods, from the Bronze Age to the Hellenistic era as well as geographic locations from Italy to Beirut. The title of this volume thus incorporates two meanings of Greek: the territory of the modern nation-state and areas of the ancient world with cultural influences from the Aegean. The diversity of ancient urban forms is therefore fully recognised and celebrated.